Inspired by our Kalahari pillow and coverlets. Matching the Kalahari shoulder sac . 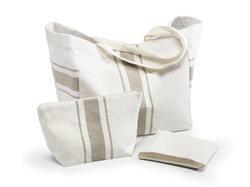 shoulder bag = 16" x 14" x 12"
set of 2 cosmetic bags = one 13" x 8" and one 9" x 7"